A new archaeology project has begun to bring to light hundreds of secretive inscriptions that have lain hidden on the walls of Norwich Cathedral for many centuries. Members of the Norfolk Medieval Graffiti Survey began a survey of the magnificent Norman cathedral at the beginning of February with the aim of recording any early graffiti inscriptions that the building might contain. The initial results have staggered archaeologists with the sheer number and quality of graffiti so far discovered. “The building is quite literally covered in graffiti”, states Project Director, Matthew Champion, “and many of the examples we have discovered so far are of extremely high quality. Far better than we could ever have hoped for”. The project, undertaken by volunteer survey teams, is working closely with the Dean and Chapter and Cathedral Archaeologist Roland Harris to undertake one of the very first surveys of its type to be carried out anywhere in England. Although other graffiti surveys have been undertaken within Cathedrals such as St Albans the Norwich Cathedral survey is the first to be undertaken on a large scale using modern digital technology. “The initial results have been very encouraging”, continues Matthew Champion, “and we have made a number of superb discoveries. The walls are covered in everything you can think of. 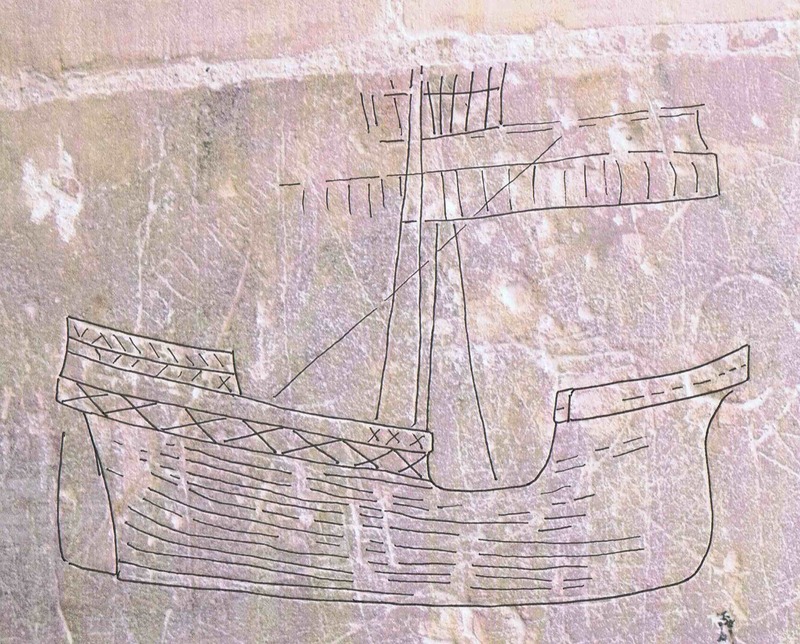 Medieval ships, names, animals, windmills, figures and prayers. Just about everything that would have been important to the citizens of Norwich during the middle ages”. Although today graffiti is regarded as something undesirable and destructive this doesn’t appear to have been the case during the past. 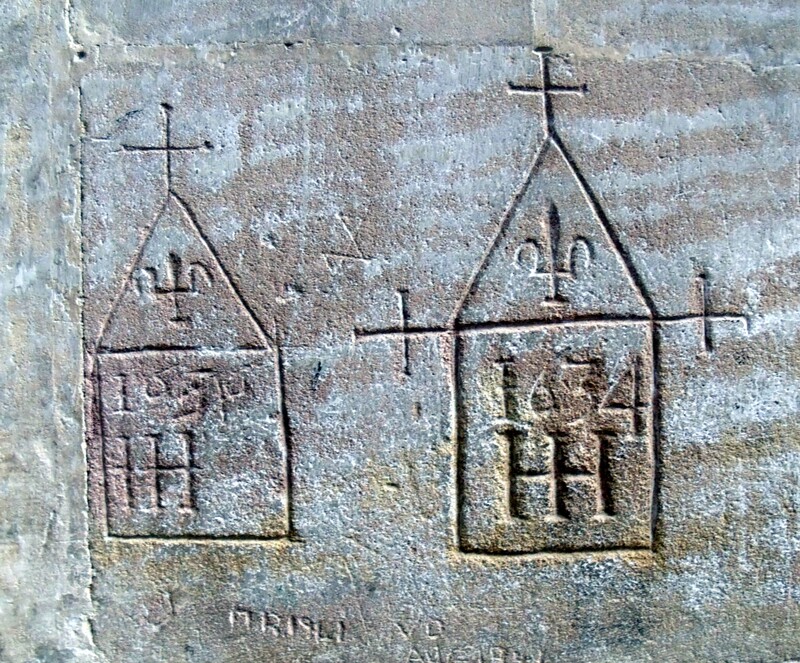 Many of the inscriptions found by the survey members appear to be ritual protection marks or prayers, and the fact that they have been deeply etched into the stonework suggests to scholars that they were created with the full knowledge of the cathedral authorities – perhaps even with their blessing. “I think we have to understand that our modern view of the cathedral is very different from the way in which it was viewed by the local people during the middle ages”, continues Champion, “particularly the ways in which it was used. Although it was a place of spirituality it appears that their views of prayer and religion were much more hands-on. They saw nothing wrong with carving their prayers into the very stones of the building”. Amongst the most intriguing discoveries made so far are a number of late medieval text inscriptions, apparently names of individuals, that appear to be upside-down. Initial suggestions that they had been carved into the stones before the stones were put in place have now been discarded. It appears more likely that these particular inscriptions were deliberately created in this way. Although their exact meaning is still a mystery it has now been suggested that these inscriptions were intended to act as curses. “We see similar practises in earlier periods”, states Champion, “when personal names are either written upside-down or back to front, and it is thought that these were meant to bring ill-fortune to the subject. In effect – a curse. Although we still have a lot of work to do it is certainly not being ruled out. If we have prayers carved into the walls”, he continues, “then I can see no reason why we shouldn’t also have curses too”. Although the survey volunteers have already identified many dozens of medieval inscriptions within the cathedral they have discovered that just as many inscriptions relate to later centuries. During the English Civil War the cathedral was reputedly used as a stable by Roundhead troops, who were notorious for defacing religious buildings, and the walls appear to bear testament to this turbulent time. In many areas of the building it is still possible to clearly make out long lists of names and initials, all with dates that link them to this period. Although it has long been known that the cathedral contained a great many examples of graffiti the large number of inscriptions has surprised everyone involved. “We knew there was graffiti here”, states Deputy Project Director, Colin Howey, “but we had no idea just how much there would be. 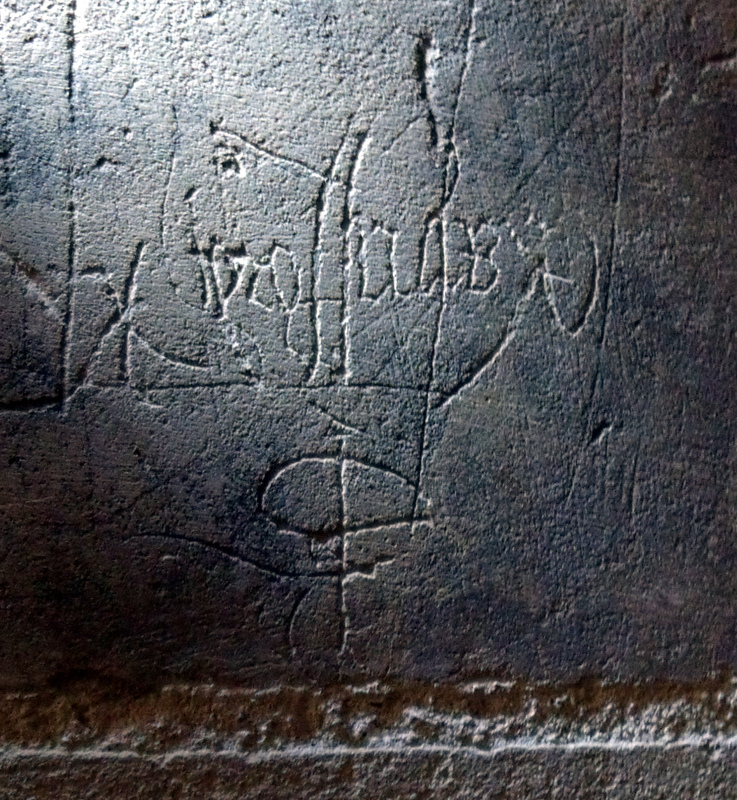 We have graffiti dating from at least as far back as the early 15th century and many other examples from the 16th, 17th and 18th centuries. However, the real thrill comes from discovering a previously unknown medieval inscription. Many of the examples can only be seen with specialist lighting and remain visible only for as long as it takes to photograph them. In many cases”, he concludes, “we are probably the first people to have seen them for many hundreds of years. You just never know what you will find next – a prayer, a curse, a ship or a windmill. It’s a real window into the hidden history of the cathedral”.